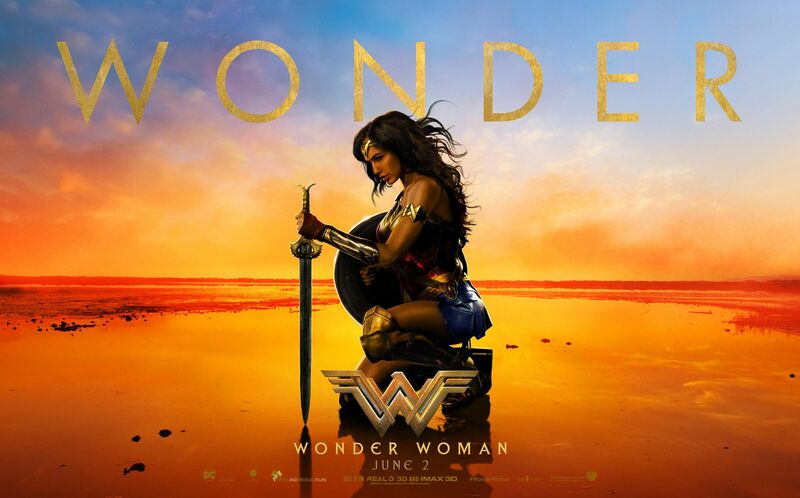 Wonder Woman marks the first female solo film since DC and Marvel began this journey of creating cinematic universes, because despite Marvel’s impressive 16 films since 2008, we have yet to see a female protagonist star in her own film, or indeed a solo female origin story, though god knows we have plenty of male stories to choose from. Surprisingly, it is DC who has taken the first step forward for equality, by not only producing an origin story for a female character, but with director Patty Jenkins at its helm. A comment on the sad state of the current gender political climate that a female director is still somewhat unusual, and though the number of well-known women directors is growing, progress is painfully slow. As both Marvel and DC continue to grow their collective universes, they also dig themselves into a growing hole as most of their films are interconnected. So, although Marvel has just about been able to maintain a balance between those standalone films, such as the latest ‘Guardians of the Galaxy Vol. 2’, and create interconnected ones for the fans, it does isolate audiences who haven’t been able to keep up with the flood of superhero films. DC is only at the start of this interlocking experience, and yet already there is an emphasis on the audience to know a great amount of detail regarding backstories for each film before having even stepped foot in the cinema. Wonder Woman bypasses it all, yes, the opening scene finds Diana examining a photo, a gift from Bruce Wayne. It’s a nice nod to the previous film, however, it’s a moment that doesn’t expect you to know who Wayne is or why he gave her the photo. If you know who he is then that’s a bonus, but it’s a moment that neither adds nor detracts from the overall experience, and serves as Wonder Woman’s only reference to other films. Now, stop me if you’ve heard this one before. The hero of the story is a reluctant man, the woman is an overtly sexualised damsel in distress who is saved by said man before he goes off to save the world. You have? Well, that’s probably because you have seen these common tropes in films for the last god knows how many years, particularly within the action genre. Sadly, it is only within the last five years or so that we have begun to see a change in this dynamic, and ‘Wonder Woman’ rather beautifully plays with this all too familiar structure. Gal Gadot returns as the titular character Diana, with the same charisma and intensity that made her the star of ‘Batman Vs Superman’, now amplified thanks to the brilliant script by Allan Heinberg and clear direction from Jenkins. Gadot is perfect casting for Wonder Women, embodying all the attributes you would expect of a warrior, presumably owing to her prior military service in Israel. She is highly intelligent, fierce, determined, skilled, and with a morally gold heart. Meaning that when villages are attacked or she attempts to comprehend the brutality of war, and why humanity does this to one another, her intense reactions feel remarkably genuine. Now, despite Gadot absolutely stunning good looks, she was the 2004 Miss Israel after all, she is never once sexualised as Wonder Woman, despite a certain director’s claim to the contrary (James Cameron). There are a few references made by characters to her beauty, such as one scene where Diana is trying to integrate with the people of London by adjusting her style, only for Pine’s character Trevor to attempt to minimalise Diana’s good looks by making her wear glasses. A move that is sarcastically remarked upon by Etta (Lucy Davis), who makes the valid observation, why would making Diana look more intelligent have the desired effect of making her less attractive? Similarly, there is a scene with Sameer (Said Taghmaoui) where after a memorable fight sequence in a bar between Diana and a local he says, “I am both freighted and aroused”. These moments are not meant to sexualise Diana as a character, they are meant as honest reactions by the men and women of the 1910s, who would presumably have never have seen women behave in this way, and quite honestly, the comments add to the comedic tone of the film. Chris Pine who plays Steve Trevor, a World War One pilot who crashes into the waters of Diana’s stunning home country Themyscira. He is initially the sexualised character, entering the film as the damsel in distress, and later shown almost entirely naked, covered only by his hand in a wide camera shot. Not only is this is a step further than most superhero films, with the exception of Ryan Reynolds in Deadpool, it totally reverses the usual dynamic we have come to expect from this genre. More importantly, Wonder Woman takes this idea a step further, for once Trevor and Diana leave the island and journey to London, Trevor is given a more commanding role. He is back in familiar territory and the two become equals, with a fantastic series of moments between them, with Trevor attempting to explain how women are expected to behave in a male dominated society, though he never tries to enforce this, while Diana sees through it all, having lived in a female dominated one. During the film, Diana’s mother Hippolyta explains how the Gods created Themyscira, and how the villain of the piece Ares was originally vanquished. This sequence is rather creatively told through a painting. It’s one of the more exceptionally clever approaches to a back story I have seen since ‘Harry Potter and the Deathly Hallows’, when the origin of the mystical items is told through an animation. The script is one of the more profound elements of this film, tackling not only the heroes path of self-discovery, but also carefully exploring subjects of racism, sexism, colonialism and PTSD. Wonder Woman is not only a step forward for feminism, but within that step, it carries as many areas of discrimination as possible. The film never oversimplifies matters nor attempts to accomplish too much within its time frame. Instead each comment or observation is rather intelligently worked into genuine moments, so that it feels as very much as if ‘Wonder Woman’ is a voice for people everywhere. OVERALL **** A wonderful, refreshing and entertaining film that has a purpose and clear direction. The combination of Patty Jenkins and Allan Heinberg is one that ought to be used more frequently in the future, particularly for this genre. RECOMMENDATION- A must watch piece of thoughtful entertainment. Never mind Justice League, I want another Wonder Woman film, complete with more fighting from Themyscira.